The 59th Annual Tennessee General Sessions Judges Conference was held recently in Franklin. The TGSJC is a statewide organization consisting of 185 General Sessions Court judges from across the state. Speakers at the event included outgoing TGSJC president Judge Denise Andre, Franklin Mayor Dr. Ken Moore, and Administrative Office of the Courts Director Deborah Taylor Tate. The presenters discussed updates on civil law, criminal law, and the new General Sessions Court data repository. Topics like the electronic indigence monitoring fund, and drug recognition evaluations and standardized field sobriety tests were also covered. Judges Katerina Moore and Vicki Snyder gave a presentation on understanding domestic violence that included an interactive session on the heart-wrenching decisions victims often must make. 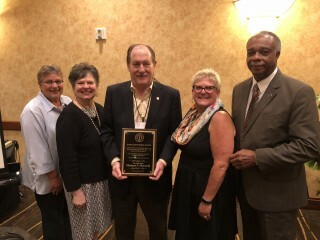 This year’s Judge Leon Ruben Award for Excellence, the highest award of honor for service to the community and to the Tennessee General Sessions Judges Conference, was presented to Judge Michael F. Mondelli of Davidson County. Judge Mondelli was first elected to the Davidson County General Sessions Court in 1990, has since been reelected three times, and has served three times as presiding judge of the court. He also served as president of the TGSJC for a year starting in September 2002. Judge Mondelli has been the chair of the Justice Integration Services’ Policy Committee for the Davidson County General Sessions Court since 2006. 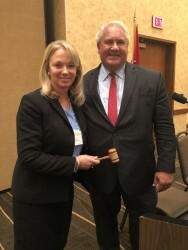 Judge Mondelli has memberships in the Nashville Bar Association, Tennessee Bar Association, and American Bar Association, as well as the American Judges’ Association. Judge Leon Ruben, for whom the award was named, served as a sitting judge in Nashville for 37 years. Judge Ruben’s daughters, niece, and long-time friend and court officer were in attendance for the ceremony. A new president of the conference was also named during the ceremonies. General Sessions Judge Gary W. Starnes was elected to serve for the 2018-2019 term. Judge Starnes was first elected as a judge of the Hamilton County General Sessions Court in 2012 and was reelected in 2014. He is a member of the Tennessee Bar Association, the American Bar Association, and the American Judges’ Association, as well as the Chattanooga Bar Association and the Georgia Bar Association. Judge Starnes has worked with the American Red Cross, the Children’s Advocacy Center, and the Shepherd Arms Rescue Mission, among other organizations.